Timeless faerie-tales are amongst the most important stories ever told, stimulating imagination and imbuing morals and values into their audience. Usually reserved for the younger generation, faerie-tales have found new life for the more mature audience in the guise of fantastical motion pictures and Tim Burton is amongst the leaders of this genre with his imagination creating one of the most powerful faerie stories of modern times - the classic movie, "Edward Scissorhands", which comes to life on stage through the talents of choreographer and director, Matthew Bourne. All faerie-stories go through variations over the years (Disney has made much money from this fact) and Bourne has done the same with this tale; reworking elements from Burton's film, expanding some, nixing others and even creating brand-new elements, such as a topiary fantasy sequence, to further the telling of an innocent unprepared to face the world that awaits him. Whilst some major plot points are adapted and altered for the stage these changes are never detrimental to the story and one of the more evocative re-workings is of the downfall of "Edward" which here becomes a sequence of celebration poisoned for all involved by a jealous boyfriend leading to the inevitable conclusion of the fable. The one error that is made is within the new origin story of "Edward" (which from the outset is a more tragic and heart-breaking one); where the film's reasoning behind the scissor hands of "Edward" is a logical one, here one is left questioning why "The Creator" would make him with such hands in the first place. But regardless of this, Bourne has fashioned a beautiful alternate take on Burton's original ideas. Bourne has also furthered Burton's knack of taking elements from one time period and installing them into another and sets the production in a world with the appearance of affluent 1950s America but with more modern elements, such as a Gameboy, in evidence. There is almost something of "The Stepford Wives" about this world; it's almost too perfect and, since nothing can last forever, fate sends "Edward Scissorhands" into this world as a catalyst for change; affecting no one more than the all-American girl, "Kim Boggs", who is clean-cut yet guilty of following the popular crowd. The detail which Bourne instils into the production, from the everyday goings-on of small-town America to the topiary sequences, helps make the production a complete piece of theatre. His choreography is organic to the characters and the situations in which they find themselves, all of which serve the plot, and is of an almost natural style with motifs seeming to come out of the everyday whilst Bourne's direction is both broad, detailed and abstract but always fluid (despite a small technical glitch in act II which put a temporary halt to proceedings). Bourne's various motifs aid in creating crisp characterisations and he creates a more human "Edward" whose ego is vulnerable to fame and success thus making his fall from grace all the more tragic. 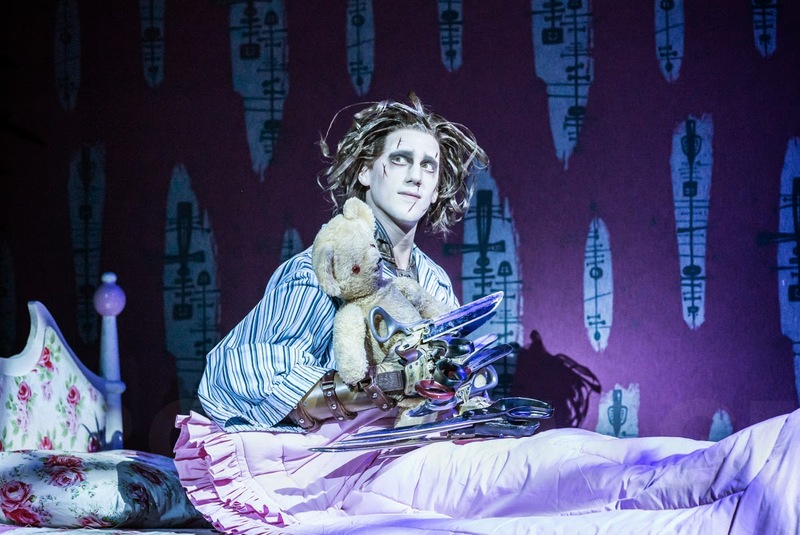 Indeed, this take on "Edward" is the most human character we see onstage. But the "Edward" here is also a figure ahead of his time with his talents producing hairstyles more appropriate to the 1980s than the 1950s. company. The classical aspect is later taken up by "Kim", the object of "Edward's" affection, culminating in a beautiful final duet between the two which is the emotional peak of the production and a sublime expression of the assimilation of "Edward" into the life of "Kim". 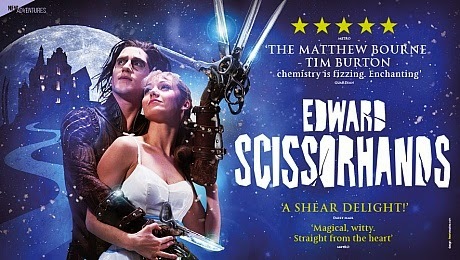 The emotional content of the piece is aided in no small part by the music by Terry Davies, which is both humorous and broad, whilst original themes by Danny Elfman composed for the film highlight the more ethereal and romantic aspects of the plot and are usually concentrated around "Edward" himself. Lez Brotherston's abstract scenic and costume designs, including the alien-like bio-mechanical design of "Edward", and lighting by Howard Harrison create the perfect environment which, at times, appropriately echo design elements of Tim Burton's film. 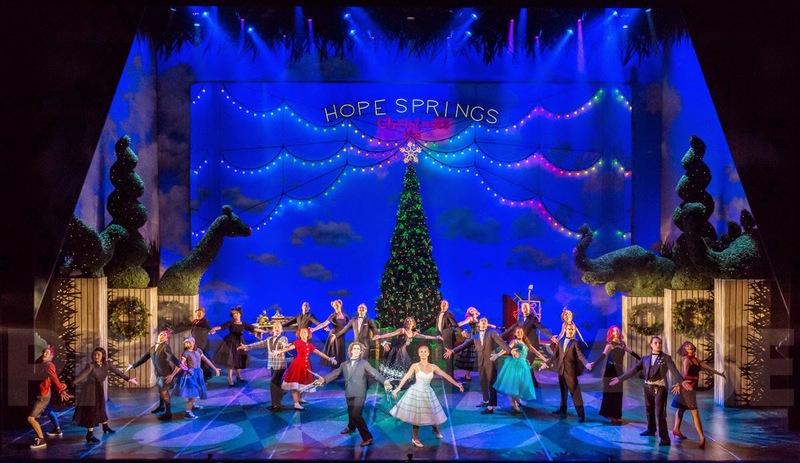 The entire company of dancers is superb and each express individuality within their parts although stand-out roles include Saranne Curtin as "Joyce Monroe" who, with the slightest move, is excellently saucy and seductive compared to the perfect innocence and grace of Ashley Shaw's "Kim". Dominic North's portrayal of the title character stands out as a complete physical performance that is evocative, emotional and ultimately pure and free from the social constraints expressed by the other characters. It is through "Edward" that the audience engage with the world that is presented. Indeed there is something so strangely human in this alien creature who intrudes into a world of front and façade that one cannot help but be drawn to, and empathise with him. And that is, perhaps, the key to both Burton and Bourne's story-telling - we must all at some point have been an outsider, someone confronted with a strange world, strange people - and to that end we each recognise a human story within this fable and one that, like most faerie-tales, teaches us a little about ourselves. And maybe those are the most powerful stories of all.